The aim is to provide new strength to working dementia carers in a supportive workplace. Improved understanding about dementia and support for dementia carers gives them a better work/carer/life balance. This aligns with the Prime Minister’s Dementia Challenge for 2020 and with the Equality Act 2010. 4DementiaCarers was founded in 2016 in Devon to raise awareness and support for working dementia carers, a significant group that has not previously been recognised or represented in the workplace. 4DementiaCarers founder, Mary Sherwood, had completed a successful two-year pilot study at the Met Office headquarters at Exeter and wants groups and organisations to learn about her Model, using expertise gained since her caring role for her mother. Dementia care is unpredictable and very different from other carer situations. The dementia carer faces risks to their own mental health and wellbeing, but is often invisible to others, even close colleagues. Face-to-face support when most needed can reduce the impact on the carer tremendously and increase productivity in the working environment. Working dementia carers are unlikely to receive benefits or be available when most support is offered, so they are particularly vulnerable. On top of their working week, carer responsibilities can involve dealing with emotional and stressful situations, which they could not have planned for or prevented. Many hours of exhausting care allow no respite. With appropriate support we can give them the tools to cope better, have more positive experiences and businesses will retain valuable skilled people. 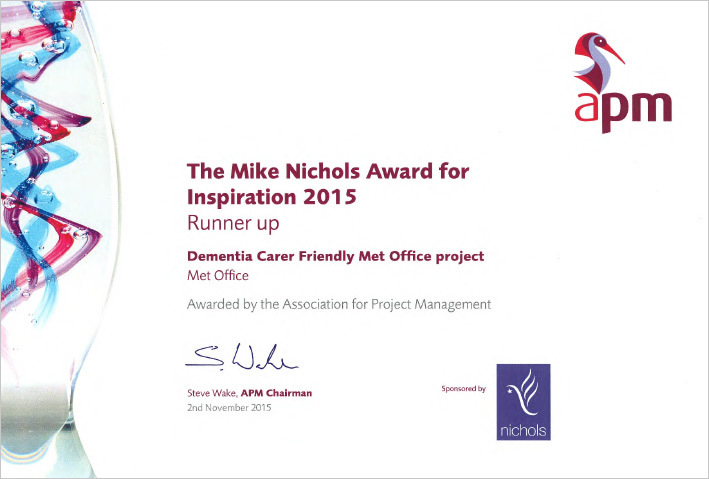 In November 2015, The Dementia Carer Friendly Met Office project was runner up in the Association for Project Management’s Mike Nichols Award for Inspiration, an inspirational project which helped a community. Teignbridge District Council is aligning to the Principles of a Dementia Carer Friendly Workplace, with monthly network group meetings for their dementia carers in 2017. Supported by School for Social Entrepreneurs 2016-17, a programme sponsored by Lloyds bank, funded by Lottery. We hold a small number of situation images with model release for restricted use in representing 4DementiaCarers. We also have images of founder Mary Sherwood public speaking. Official photographs at future speaking events will require the speaker’s and normally the event organiser’s permission. Please contact us for further details. Master 4DementiaCarers logos are available in different formats for use online or in print. It is important to use the appropriate logo in any articles or publicity. Please contact us for further details. If you require copy content for a relevant publication, given reasonable time we may be able to provide suitable copy by email, or we may be able to arrange a telephone or face-to-face interview. Please contact us for further details. A limited amount of material is available, intended for distribution at events or within an organisation that has booked a workshop etc. If available, we may ask for a contribution to offset cost. a. To raise awareness of a growing but hidden group of vulnerable carers in our midst. b. To illustrate the proven social and commercial benefits of a Dementia Carer Friendly Workplace. Please see upcoming engagements in 4DementiaCarers Events Calendar. Please contact us to check availability or to book attendance at future events.